SOUTH AFRICANS- PREPARE YOURSELF FOR 3-YEARS OF EXUBERANT FUEL LEVIES! THE National Treasury has identified the Road Accident Fund as a potentially huge liability on South Africa’s finances, and says large increases to the fuel levy will be needed over the next three years to avert short-term disaster. The medium term budget policy statement delivered by finance minister Tito Mboweni on Wednesday (24 October), highlighted a big problem with the RAF. “The Fund represents a potentially large liability,” it said. 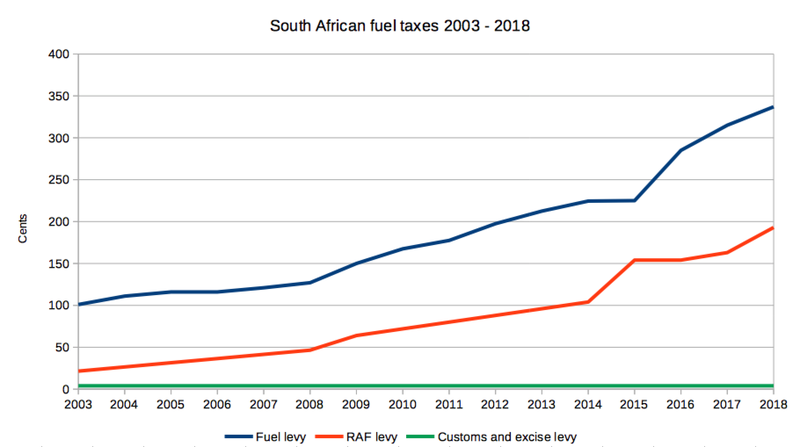 “Despite a 30c increase to the RAF levy in the 2018 budget, the fund’s liability is expected to grow to R393 billion by 2021/22 from R206 billion at present.” To combat this, the RAF will require “further large increases to the fuel levy in each of the next three years” to manage the short-term liability. South African motorists are currently experiencing record high fuel prices, and have called on government to intervene to alleviate the burden on households and businesses. However, government has stated that there is little it can do, as the the fuel price is largely beholden to things “beyond its control” ( Does that now include all the exuberant government “royalties” as well we wonder?) – specifically international petroleum prices, as well as currency exchange rates. One aspect that can be controlled by government, however, are the taxes that are applied. Currently, taxes make up almost 40% of the total petrol price (R5.34) with the RAF component making up R1.93 of that. Over the last decade, the tax component of the petrol price has increased over 200%, with the RAF levy growing 315%. The graph below details how the taxes and levies have changed over the past 15 years. 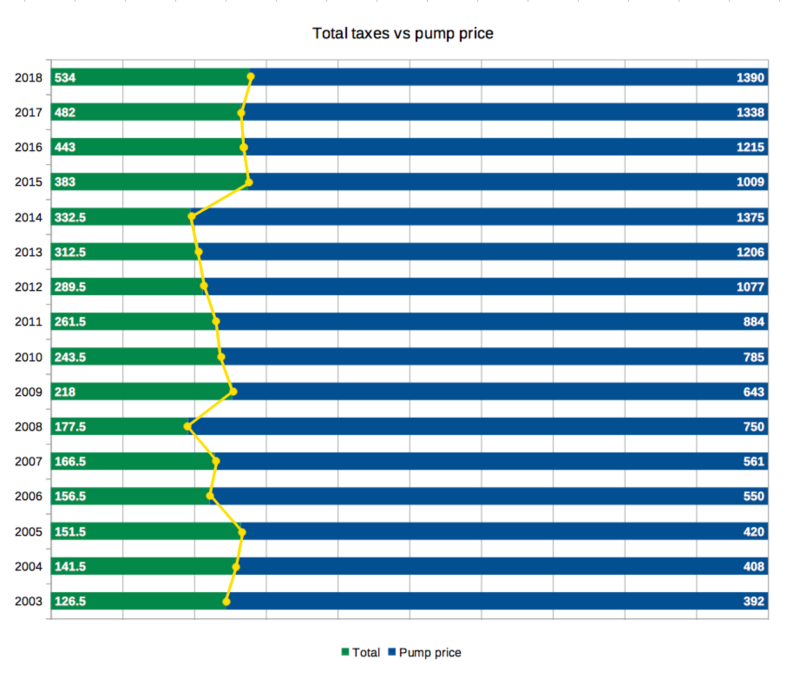 The graph below shows how the proportion of taxes in the total fuel price has changed over the past 15 years. The fuel levy in 2018/19 is projected to bring in R77.4 billion in revenue in the, up from the R70.9 billion in 2017/18 – reaching an estimated R96.5 billion in 2021/22. One wonders if say we can stop the sleaze-bucket government from plundering the state coffers- if that maybe also can bring down the inhuman fuel prices? Maybe Tito must have a 3-year salary cut imposed on all politicians too. It’s not fair that only the populace must suffer financially while the “fat cats” are laughing all the way to the bank on their free fuel tickets...right?